Six60 announce their plans for next summer, and and the news is both massive and groundbreaking. They are going to be the first New Zealand band -ever- to headline at the iconic venue, Western Springs Stadium. The concert on Saturday 23rd February is the band’s singular New Zealand show for summer and fans from all over the country are encouraged to make their plans to come to Auckland sooner rather than later. If that news wasn’t enough, there’s more! the all-ages show will also feature a support line-up curated by Six60 of the biggest Kiwi acts right now Drax Project, Sons of Zion, SWIDT and IllBaz. 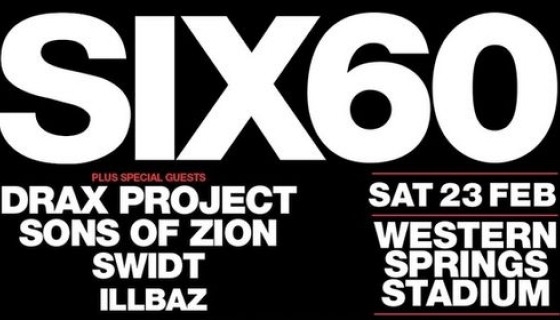 According to promoter Brent Eccles, there couldn't be a better time for a Six60 show at Western Springs. Singer Matiu Walters says playing a venue like Western Springs is a huge deal for the band and they’re in full planning mode to make it an amazing experience for fans. For their only show this summer, it's an opportunity not to be missed.